On the evening of the 23rd, Haig and Byng met to assess the merit of continuing the operation or pull back to Flesquieres Ridge. After weighing various considerations, Haig decided to continue the operations. Also on the 23rd, the 40th Division (Major-General I. Ponsonby) attacked Bourlon Wood, and after four and a half hours of hard fighting, captured almost the whole of the wood and entered Bourlon Village. A number of German counter-attacks this day prevented further progress. West of the woods, the 121st Brigade attacked Bourlon Village and managed to storm the south corner with its support tanks. On the evening of the 25th, a fresh attack by the Germans regained Bourlon Village. The struggle for Bourlon Village, Woods and Fontaine-Notre-Dame would continue for several days, resulting in fiercely contested attacks and counter attacks. 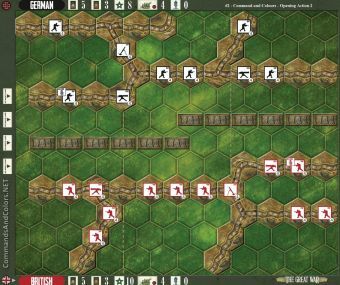 The 9 building hexes form a Turn Start Temporary Majority Medal Objective worth 1 Victory Medal for the side that occupies the most buildings. The German player starts with 1 Medal. 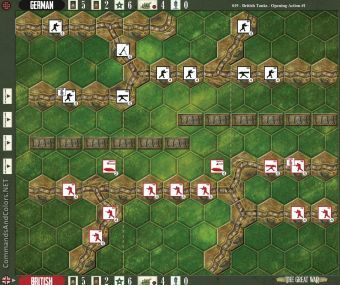 The British forces gain a Sudden Death Victory at the start of their turn, when there are no German units occupying any Bourlon Wood hexes. That is the answer.. see the BGG link for Richard Borg's reply to the original query. Bourlon Wood, is just the 15 woods hexes in the middle of the map.